Can parents and adult children travel together and return from the vacation still a happy family? Yes, according to Dave and Terri Long, who traveled to Scotland with their daughter Natalie and son-in-law Chris. Read what all four have to say about their family vacation and their tips for traveling with adult children. Why Scotland? 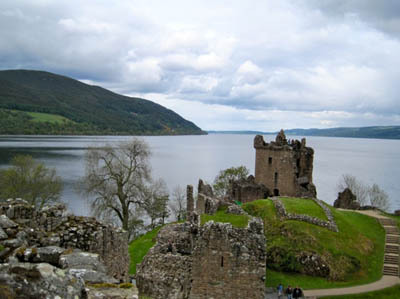 Scotland is a beautiful country, but it’s hardly a tourism hot spot. What was your main reason for going? Natalie & Chris: For that very reason – it’s beautiful. It seemed like the perfect combination of adventuresome and not overly challenging to navigate. We were looking for a vacation with a mix of outdoor and cultural activities. Dave: There’s a romantic attraction to a place that finds its way into all these historical movies like Braveheart, Rob Roy, etc. It’s a place of raw beauty without the crowds – because of the clouds. Terri: Before we went, I knew next to nothing about Scotland. I wasn’t particularly excited about a nature trip, as I envisioned it—a place of “raw beauty,” as Dave describes it. My idea of a great vacation typically involves cities or beaches and excellent cuisine. For me, the opportunity to spend time with Natalie and Chris was the initial attraction. What made you decide to go away together? Did you have any reservations? If so, what were they? Did any problems you anticipated materialize? Natalie & Chris: We asked for money towards a trip to Scotland for Christmas. Mom and Dad offered to take us and go as a group. We get along really well, so of course we were really excited! We had some reservations about creating an agenda that would be fun and interesting for all four of us. That didn’t seem to materialize. Everyone had a laid-back approach to the itinerary. Dave: They are fun to be with and they are pamper-free, low maintenance regardless of the conditions. Not everyone wants to go somewhere that is cold and not known for fine food – yes, it snowed on one of our late-May hikes near Fort William. Terri: Natalie says they had reservations about creating an agenda that would be fun and interesting for everyone; by everyone, I suspect she means me. I’m embarrassed to admit this: I was afraid I’d be bored. We’d traveled to Ireland in the late ‘90s; while I loved Dublin, Galway, and all the smaller cities in between, driving the Ring of Kerry was my least-favorite activity. It rained that day and our kids, teens at the time, were antsy, so that may have been the reason. I envisioned Scotland as the Ring of Kerry on steroids. Of course Scotland is nothing like I’d imagined. It’s a gorgeous place with wonderful, friendly people. I loved every second of our trip. What was the highlight of your trip? Why? Natalie & Chris: There were a few. I’d say one was the hike up Ben Nevis, the highest peak in Scotland. Though we didn’t make it to the top, that was a really beautiful day and lots of fun. Another was the evening we went to the play The Woman in Black in London. After a computer glitch left us without tickets, the staff at London’s Fortune Theatre wound up offering us complimentary box seats. The show was amazing and so were those seats! Oddly, another highlight was just driving through Scotland. It was a cool way to see the country… though there were some moments of carsickness. Dave: Other than our evening Scotch rituals before bedtime: having a beer in the little pub at the Ben Nevis Inn. This place is something you don’t find in the States. It felt older than old–this quaint little pub at the base of the mountain, with all these hikers hanging out in the middle of nowhere, at the end of these ancient-feeling foot paths. It reminded me of a Van Morrison song called” Haunts of Ancient Peace.” Transcendent. Best food: an unexpected delight from room service at the Missoni Hotel, a boutique hotel in Edinburgh. Terri: I’ll make that four. The hike up Ben Nevis was surreal. I wouldn’t call myself an experienced climber, but I enjoy climbing and we’ve climbed quite a few peaks in the Northeast. In New Hampshire, the trails shoot up through the woods. On Ben Nevis, the gravel trail traverses the face of the mountain, and you’re always exposed, giving you breathtaking panoramic views the entire way up. If you’ve seen The Lord of the Rings movies and can picture the satiny green Shire, you know what this looks like. The Woman in Black was certainly a highlight. The theater management could not have been more gracious or generous. Not to be corny: it was the sort of moment that reaffirms your belief in humanity. However great the trip, there’s a moment when you wish you were home. What was yours? Natalie & Chris: For me, I don’t think there was a moment I wished I was home, until our flight took off for Boston. But for Chris, a stomach bug definitely left him longing for the comforts of home. Dave: At no time during the trip with Natalie and Chris. Later, in our little place in the Lakes district in England, I had to deal with work problems but the itinerary was too magical to be spoiled by anything. Terri: I agree with Dave—magical! I can’t think of a better way to describe it. It was a wonderful trip. What surprised or delighted you most? What was your least favorite aspect of the trip? Why? Natalie & Chris: Everything surprised and delighted us. There was really no one moment or activity that was the most delightful. It was really such a great trip. BUT… the travel to Edinburgh was a bit exhausting. We flew from Boston, landed at London Heathrow around 7 AM local. After clearing customs, we went straight to the tube for the 45-minute ride to King’s Cross train station. There, we immediately boarded the London – Edinburgh train. After selecting our seats and loading our many pieces of luggage, we discovered we were in a train car with a broken cooling system. We’ve had better journeys. The “Squeezey-Jet” flight back to London wasn’t a picnic, but it certainly beat the northbound leg! Dave: The Indian Food in London is outrageous. The width of the roads was certainly a surprise. We had to do everything we could to keep inside our bounds when driving. They are great drivers over there, no margin for error. I was astonished how remote Scotland is and how far north—11:00 PM sundown. I wish we had hiked more foot paths . . . and seen Hadrian’s Wall. We could have skipped Inverness. Terri: With my preconceptions so far off base, everything about Scotland surprised and delighted me. Edinburgh is a magnificent old city, with a fascinatingly storied history. The Scottish countryside is so green, resplendent. Sometimes, looking out the windows of the car, it would seem as though you were looking at a painting. The train from London to Edinburgh was definitely a downer. Dave and I left a few days ahead—Chris is in medical school and had finals. By then, we’d had a chance to adjust to the 6-hour time change. Natalie and Chris arrived in London that morning and took the tube directly to the train station; they were exhausted. Would you go away together again? Why or why not? Natalie & Chris: Definitely – next up India… just kidding Mom! Maybe somewhere in South America. Dave: Probably not… they have a noisy baby who is arrogant and grumpy – just kidding. He or she isn’t born yet. No question about it. We’ll definitely travel together again in the future—often, I hope. Terri: Absolutely, in a heartbeat. Are you packed, Natalie and Chris? Seriously, I love traveling with Natalie and Chris. They’re wonderful company. I’d go anywhere—India included—that they’d like to go. Terri Giuliano Long teaches at Boston College and loves traveling with her husband and children. She blogs at www.tglong.com/blog/ Her first novel, In Leah’s Wake, was released in 2010. 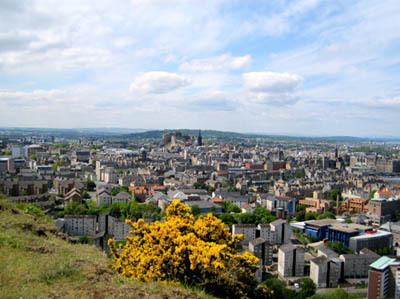 Above Right: View of Edinburgh from Arthur’s Seat, Holyrood Park -about a mile east of Edinburgh Castle, a 12th century Scottish fortress (at the center of this photo). State:Country:About Me:Web site:Brief Bio:Our TravelingMom Web Team works to bring you the freshest and most interesting content on the web. Wow! scotland looks beautiful! How fun you can travel with your kids. hopefully we all get along when they are older and can take a fun trip like that.